Looking for a new pasta recipe to serve your family? 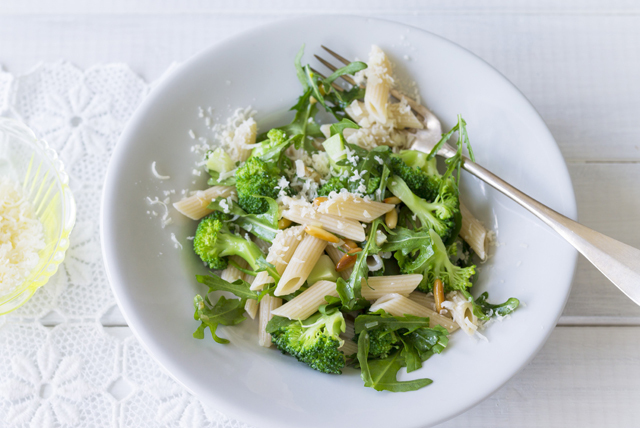 Try our Penne with Arugula, Broccoli and Pine Nuts recipe. This vegetarian-friendly pasta dish is as easy to make as it is delicious. Cook pasta in large saucepan as directed on package, omitting salt and adding broccoli to the boiling water for the last 3 min. Drain, reserving 1/2 cup cooking water. Heat 2 Tbsp. dressing in large nonstick skillet on medium heat. Add onions and garlic; cook and stir 7 min. or until onions are softened. Stir in reserved cooking water; bring to boil. Simmer on medium-low heat 2 min. or until sauce is reduced by half. Add pasta mixture and remaining dressing; cook and stir 2 min. or until heated through. Remove from heat. Add arugula and cheese; mix well. Sprinkle with pine nuts. Season with freshly ground black pepper to taste before serving. Substitute toasted chopped walnuts for the pine nuts.